Creatively using a narrow lot to his advantage, architect John Carraway designed a French cottage with a seamless flow between house and garden. 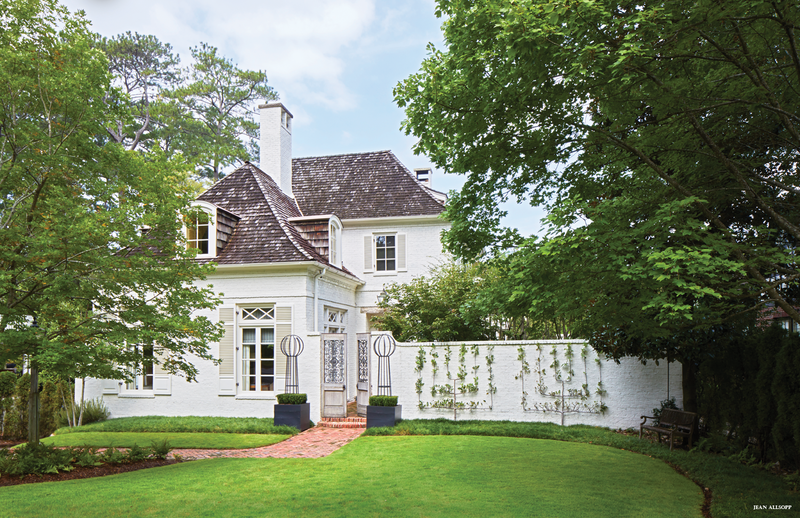 ABOVE Architect John Carraway helped Jeanne and Mabry Rogers design a classic French country look with a shake roof and stately white-painted brick. Placing the new house to the left of the lot and inserting a garden on the right not only created outdoor rooms for enjoying and entertaining but also gave the family the privacy they desired. Every really talented architect knows that siting is absolutely key to designing a house. Jeanne Rogers and her husband, Mabry, discovered that when they began to consider renovating their existing home. The couple quickly realized they were more likely to get the house they wanted by purchasing the empty lot next door and building new. And while the lot kept them planted in the neighborhood they loved, it presented a challenge because of flanking houses, narrow depth, and close proximity to the street. The Rogers had hoped for some privacy, but constraints suggested otherwise. That’s where the expertise of architect John Carraway of Carraway & Associates came into play. ABOVE LEFT The dining space shares the same herringbone-patterned pavers as the entryway, a flooring Jeanne loves because it reminds her of her childhood home. A simple English pedestal table is flanked by four classic French chairs, leaving the statement to be made by the antique Italian iron-and-wood chandelier. ABOVE RIGHT The range is a standout with its sleek, sculptural hood. White quartz countertops maintain the serene palette, and a marble backsplash works as an element of modern art. 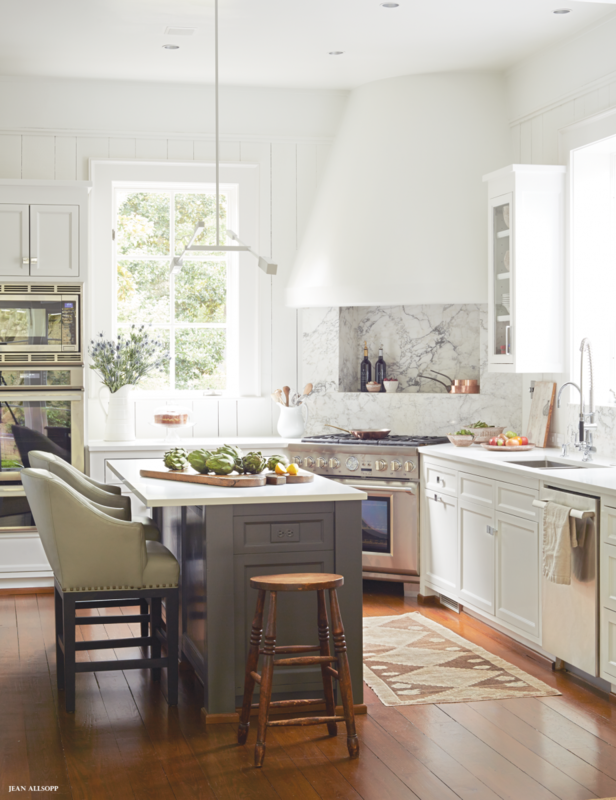 The island, painted Sherwin-Williams Sealskin, underscores the marble’s gray vein. ABOVE The living room features numerous windows that provide generous views of the garden. To bring in both an old and new feel, Jeanne incorporated a modern shelter mohair sofa with classic wingback chairs. A grouping of nine antique Italian bookplates anchors the space over the sofa. 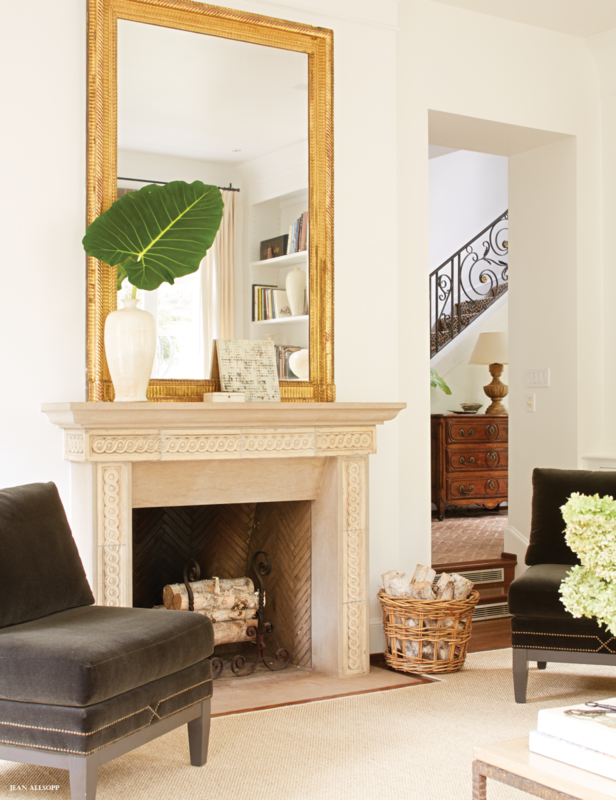 ABOVE LEFT The home’s entryway combines a mix of Jeanne’s favorite elements, including a collection of antique walking canes and an antique French chest. “A big chest helps anchor a space, and the wood provides warmth, ” she says. 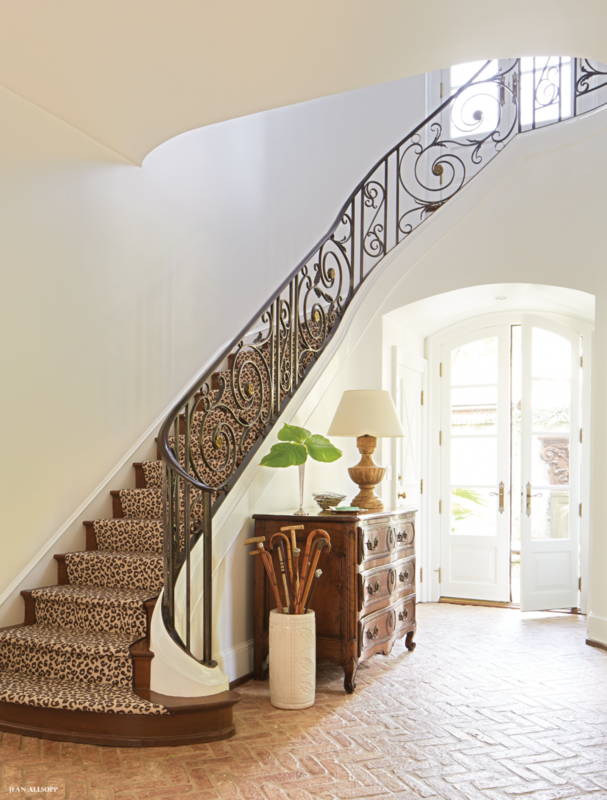 The classic leopard print from Hiltz-Lauber paves the staircase, adding modern contrast to the classic French railing custom-designed by Iron Stair Railing: Artistic Birmingham Iron. Oversized spliced brick pavers laid in a herringbone pattern recall a design in Jeanne’s childhood home. ABOVE RIGHT The antique French mantel in the living room is one of the many pieces Jeanne has found during her travels over the years. A French basket weave mirror reflects the abundance of natural light. ABOVE LEFT A highlight of the living room is an antique Dutch desk. 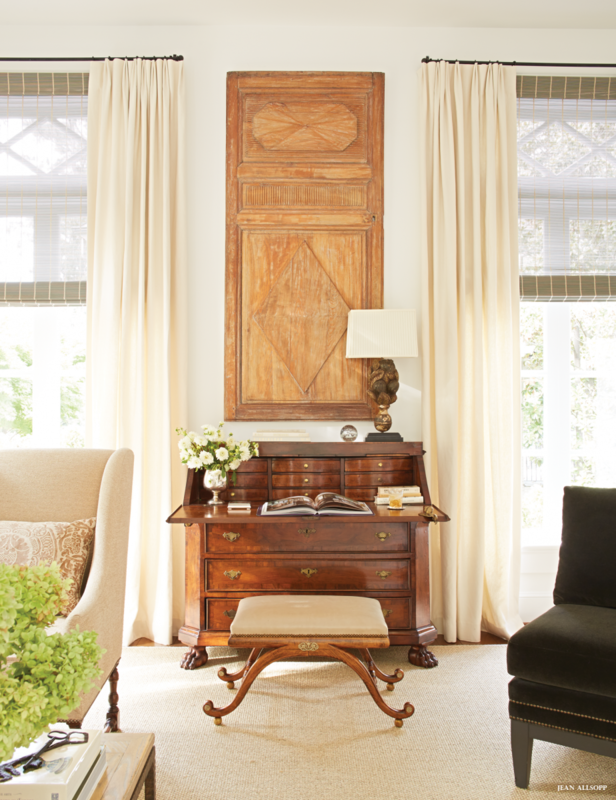 An antique paneled door hangs above. “It’s one of those pieces you find and love and just figure out a way to use, ” Jeanne says. 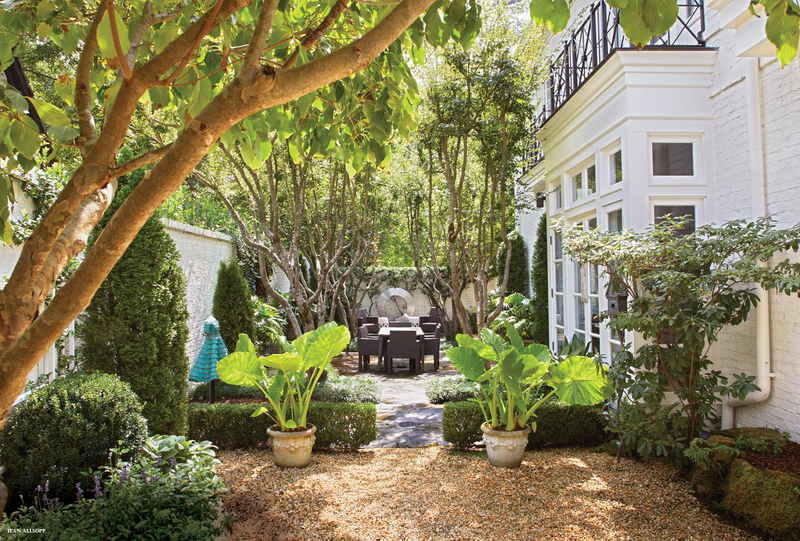 The courtyard garden is an integral part of the home’s design. Shifting the house to one side of the lot and incorporating the garden on the opposite side created seclusion from the street and neighbors. It also created a blissful utopia that became an extension of the home’s interior space. Here’s how horticulturist Kevin Webb of Prime Landscape Services helps keep it that way. Keep it simple. The front wall of the garden includes just five different plants: rosemary, sweetbay magnolias, mondo grass, boxwoods, and three-tiered candelabra Gala apple trees. While the plants are few in number, they are used in large scale to best outfit the space. Define the space. In creating an outdoor area, approach the space just like you would the interior by defining “rooms.” Here, the garden is obviously one big space, but it’s organized into three “rooms, ” and each has its own unique feel. Think it through. Not just any pretty plant is ideal for any given garden. Here, Kevin used mondo grass where possible to have green grass year-round. Four Japanese maple trees in the center of the garden anchor the space and create a canopy for needed shade.